We're really excited to launch one of a few major updates that are focusing on improving instance deploy and archive times. 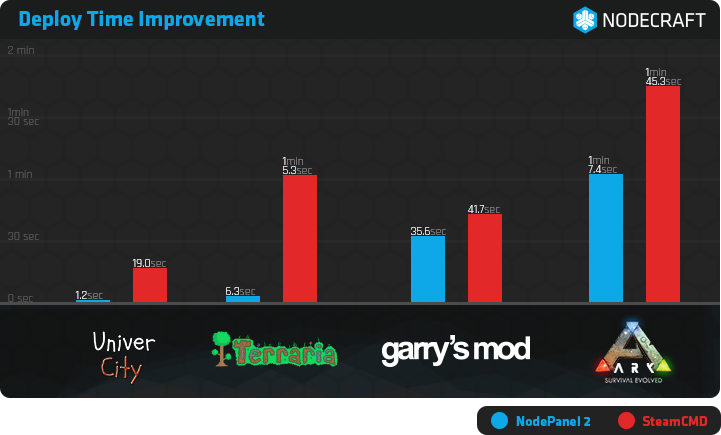 Included in this end-of-the-month update, we've improved deploy times for all Steam-based games like ARK: Survival Evolved, Garry's Mod, Terraria, and nearly 20 other games. For many games the install time is 1.5X faster, while other games deploy in mere seconds. Rather than depending on Steam's tool (SteamCMD) to install your game, we've implemented a system to track Steam updates and deploy from a system-wide cache. For our customers this means you'll have your game installed faster without any of the stalling or intermittent slow speeds from before. Most important of all, there's no longer a multiple-healthbar situation where the progress gets reset by Steam's validation steps. Have you ever tried adding workshop mods to your server? Maybe you need to create a Steam auth token, but have no idea what that is? Our customer support team has you covered on our YouTube channel. We'll be publishing a new video every week that covers a range of topics from server settings, to control panels, and even in-game settings to make sure your server is ready for game night. [System] All Steam games now deploy much faster. Initial deploys no longer rely on SteamCMD which was prone to stalling/slow speeds/unreliability. [System] Improved SteamCMD stability when used for updating servers. [Support] We are now publishing a YouTube video every week to cover topics in our Knowledge-base. [MOD] [Eco] Added more config options, (server description, password, whether it's public, etc). [MOD] [Eco] Editing (.eco) config now report any problems with your changes. [MOD] [Arma 3] Added support for custom server arguments, mods, and support adding MySQL databases. [MOD] [Minecraft] Added more visual options to Minecraft settings. [MOD] [Minecraft] Added support for Java 10 & Java 11. [FIX] [ARK] Max-player settings now behaves as expected. [FIX] [Don't Starve Together] Max-player settings now behaves as expected. [FIX] [Don't Starve Together] Improved player tracking to more effectively handle rejoining players. [Fix] [Minecraft: Bedrock] Tweaked our output parsing to support for newer versions of the Bedrock Vanilla server. [Fix] [TF2] Improved Networking settings. As always, we want to thank everyone who provided their feedback! If you have a suggestion for a feature or game you want to see at Nodecraft, come let us know!